UPDATE: One of us here has today off and is committed to calling every US Senator, Governor, and emailing ALL Members of Congress to tell them all that Tom Daschle is unfit to serve as Health and Human Services Secretary. Yes, only Senators will vote on the confirmation, but here’s our thought process: some of these Members of Congress don’t get much attention. When 6 people call them out on something in a day, they panic, since most days their phones rarely ring. The same is true for Governors. If they start getting tons of calls today making them aware of today being the anniversary of the ratification of the 16th Amendment, and how shameful it is a limousine tax cheat like Daschle is being considered for Cabinet appointment on today of all days, the Governors and Members of Congress are sure to put calls into their respective Senators too. THOSE calls will carry more weight than all of us calling the Senators directly. Whoever’s answering the phone in the Senators’ offices are sure to pay attention when the Governors’ offices start calling to tell them “people are burning up the phones upset about Daschle”. ESPECIALLY Governors facing re-election in 2010. 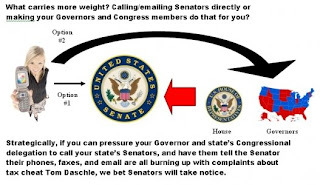 If we can talk to 100 Senators and 50 Governors’ offices today and tell them Daschle must resign, can you make a few calls yourself and report back on this thread what response you get and who you talked to? If you are visiting from other sites, can you encourage your readers to do the same thing? This is a bipartisan call to action as a tax cheat is something neither Democrats nor Republicans want in charge of billions of dollars of Health and Human Services stimulus spending. Daschle has no moral authority and has proven he can’t be trusted with money. So, Sally needs to go! Tom Daschle needs to withdraw his name from consideration to be the next Health and Human Services Secretary. The more that’s revealed about his deliberate decision to not pay hundreds of thousands of dollars in taxes on his chauffeur-driven limousine, the angrier we get that this smug bush-league Sally Jesse Raphael impersonator thinks the 16 Amendment does not apply to him. That’s important because today is February 3rd, the day the 16th Amendment was ratified all the way back in 1913. 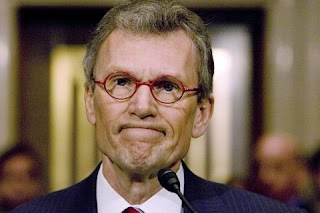 We know Daschle’s slow on the uptake, but he’s probably heard of income tax by now, and as a former Majority Leader in the Senate, he should know better than to cheat the IRS when he’s been raking in millions the last several years cashing in on all of his Washington connections. This is not an instance of someone not knowing what the law is. Here in Chicago, City ordinances governing parking are bizarre and surreal in the extreme. If you are not from Chicagoland, you would not know you aren’t allowed to park on certain streets odd days of the week, but only during Cubs night games — or that your car can be moved to anywhere in the City, at any time, without your knowledge or permission, if the City just feels like it. Every day, dozens of tourists and family members visiting Chicago residents receive City-issued heart attacks, thinking their cars were stolen in Wrigleyville, only to find the Mayor’s transportation office had their vehicles towed to a parking lot somewhere on the Southside, just because, or so botanists can inspect tree limbs and squirrel nests on your street (true story, that honestly happened to one of us, and that was the exact reason the City gave for moving the car: to look at squirrel nests in branches overhead). So, sometimes in life your car’s towed because of unpredictable squirrel nests wholly out of your control, and completely nuts. Daschle’s a nut, but his taxes are a completely different matter because he knew full well what the law was, but chose not to follow it. This New York Times piece breaks things down even further, clearly showing Daschle deliberately broke the law and continued to do so even after considerations began for him to join Obama’s Cabinet. June 2008: Daschle admits he was aware he owed taxes on his chauffeur-driven limousine and told his accountant to “investigate it”. June - November 2008: Daschle and his accountant investigate his tax matters, but decide not to do anything about them and don’t pay a cent to the IRS. November 2008: Obama’s transition team discovers unrelated tax issues that Daschle owed money for. So, not only did Daschle not pay his limousine’s taxes, but he cheated in other ways to (on which the media’s not reporting). It appears Daschle intended to keep ALL of his tax problems quiet until the Obama team called him on some of it. Then, and only then, did Daschle admit he received the equivalent of $255,000 in income from a large corporation to fund his personal limousine service. November - December 2008: Daschle admits to the Obama team that he owes the IRS a lot of money (more than three years’ salary for the average American family). January 2, 2009: Daschle reluctantly pays $140,000 in back taxes, while acknowledging he owes more, but at this moment is refusing to pay it. As bad as Tim Geithner’s tax problems were with the money he owed the IRS from his “self-employment” and other issues, Daschle’s are much, much worse — especially considering Daschle’s past experience as Majority Leader. That means he should be judged by a HIGHER STANDARD than those without such legislative experience (not allowed to skate over unpaid taxes because of his past glories). Considering today is the anniversary of the 16th Amendment’s ratification, the day the federal government was first allowed to set and collect income tax, all 100 US Senators need calls, emails, and faxes to remind them of this day in history — and express to them that tax cheats like Daschle should be punished, not rewarded with cushy Cabinet positions to further pad out their resumes. Capitol Switchboard: (202) 224-3121 Call and ask to be connected to your Senators today! If you don’t know who represents you in Congress, here is a link where you can put in your zip code and find out. Here’s the complete email and fax list for all Members of Congress (and state governors too). Call everyone, and tell them Tom Daschle is not morally capable of being the Secretary of Health and Human Services if he can’t be bothered to pay his own taxes.